Screwpine or pandan leaf is well known in preparations of traditional cakes among Malaysians, also as flavouring and fragrance. I use homemade pandan paste whenever I bake with pandan flavour. 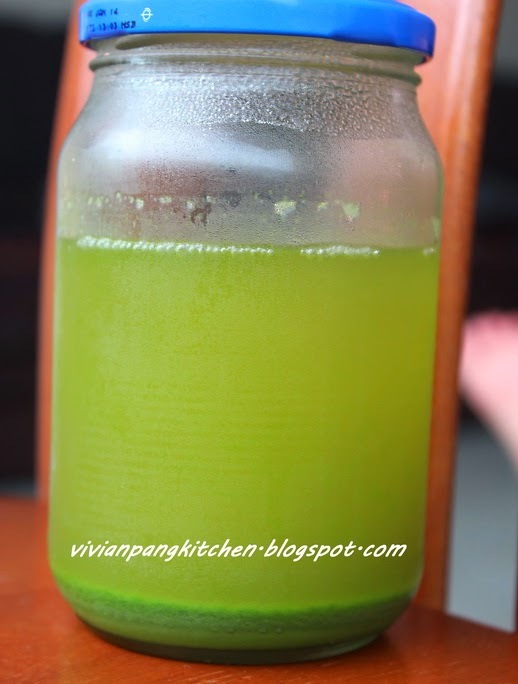 Pandan paste is pandan concentrated juices. I need at least 2 days to get the paste ready. You may curious why takes so long? 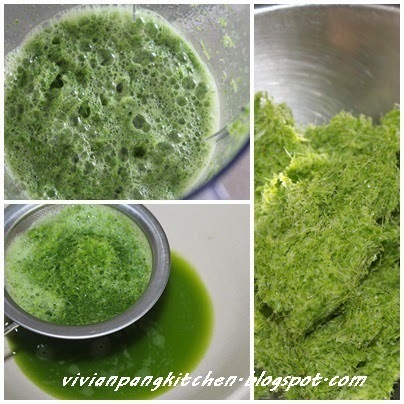 Why not use straight away after squeeze the juice from blitzed pandan leaves? Read further to find out the answer. Cut leaves into small pieces, together with water and blend. After 1 day in fridge (a thick layer form at the bottom). It is the concentrated pandan juice. Sometimes take few more hours longer. 1. Wash and clean the pandan leaves. 2. With a scissor cut pandan leaves into small pieces. 3. 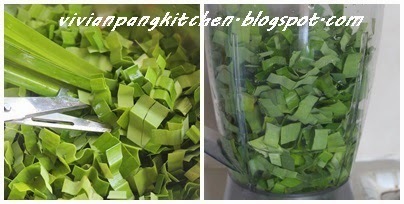 Add pandan leaves pieces and water into blender and process till fine. 4. Pour blitzed pandan in a fine strainer, squeeze out the pandan juices. 5. 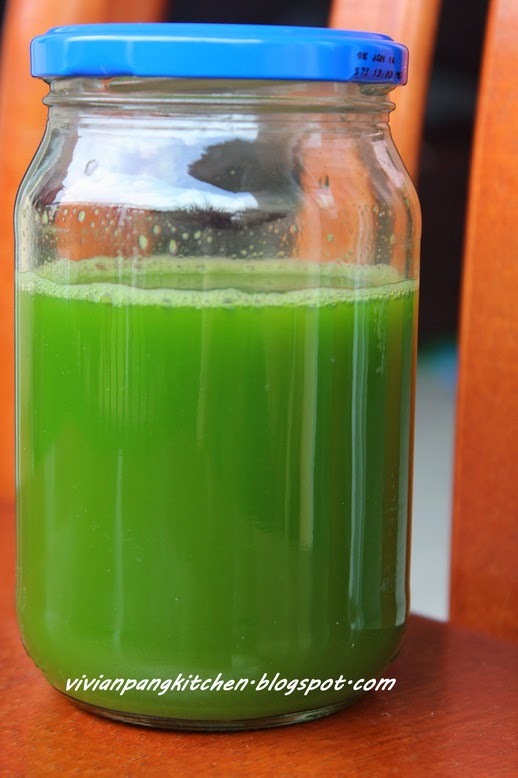 Pour the pandan juices in a jar, and leave it in the fridge. 6. The next day, a thick layer form at the bottom. Pour away the upper layer of water, retain the pandan paste. Note: You may keep up to two weeks in the fridge or till it turns bad. Hehe I made this before also... but I only use for making mooncakes. Does yours have a very nice fragrance when used in cakes? I used in making pandan chiffon and the fragrant is defitetly better than artificial essence. so you are coming up with some pandan related bakes? love the flavour of pandan! Pandan is one of my favourite flavour. Making your own paste is definitely better! 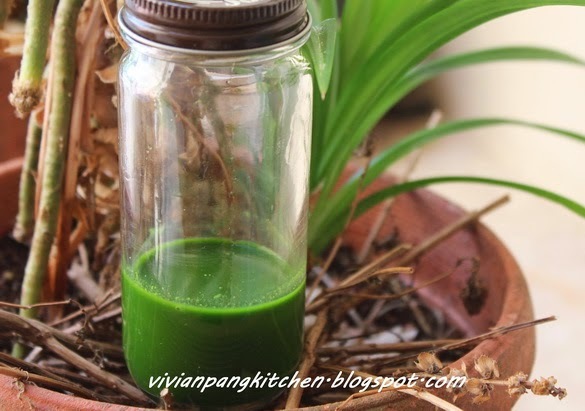 Making Pandan paste with natural pandan leaves is sure better then artificial ones. Having them ready made in the fridge sure comes in handy when you need it! How long the pandan paste can store in fridge? Wow! Looks amazing. Beautiful colour! I'm very curious what does pandan taste like?